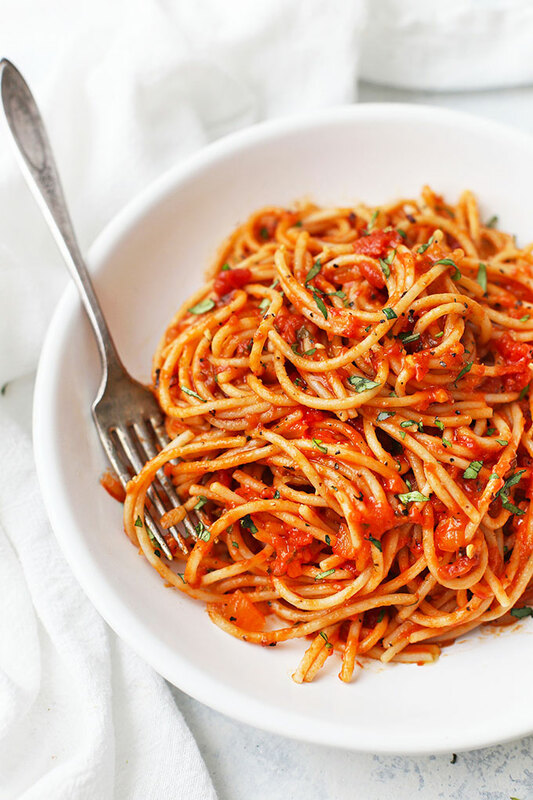 Spaghetti was always one of my favorite dinners growing up, which proved lucky when I went to college and had an airtight grocery budget. Even now that we have more room in our grocery budget and have 2 kids in the mix, pasta night is always a big hit. 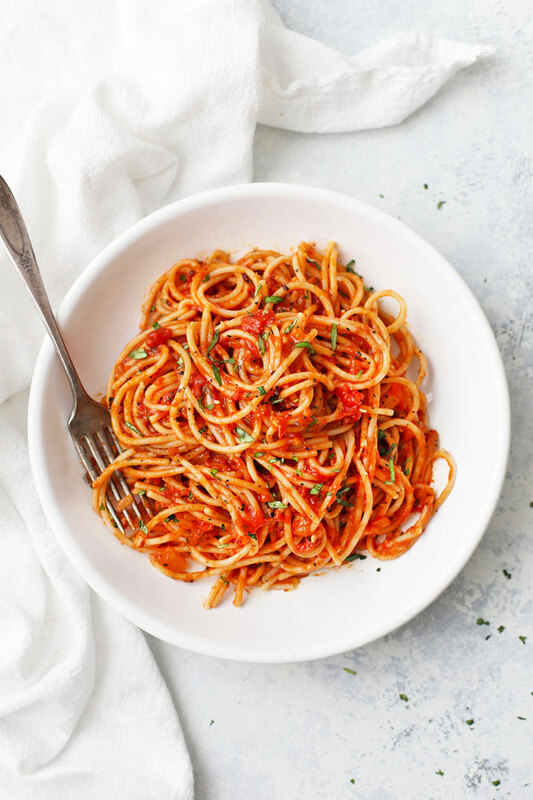 We’ve had fun experimenting with different sauces + pastas (including “pastas” like zucchini noodles or spaghetti squash) in the last few years, and pomodoro is one of my favorites. I realized I haven’t shared the recipe yet, so today’s the day to change that! If you haven’t had it before, Pomodoro is a quick tomato sauce similar to marinara, made with tomatoes, olive oil, garlic, salt, and basil. Recipes vary (some add onion, some don’t; some use fresh tomatoes, some don’t). But it’s easy and delicious, and one of my favorite pastas to order at restaurants. How Do You Make Pomodoro Sauce? EASY. Pomodoro sauce is as simple as saute + simmer + serve. It’s just a handful of ingredients you probably already have on hand + a little fresh basil. Crushed tomatoes – When I can find them, I like using fire-roasted crushed tomatoes because I like the extra depth of flavor. Otherwise, the regular ones do the job! Can’t find crushed? Buy diced or whole canned tomatoes and pulse them in a food processor or blender until they’re mostly smooth with just a little texture left. Onion & garlic – A little bit of onion (or a shallot) and fresh garlic are the aromatic base of the recipe. They’re the first layer of flavor! 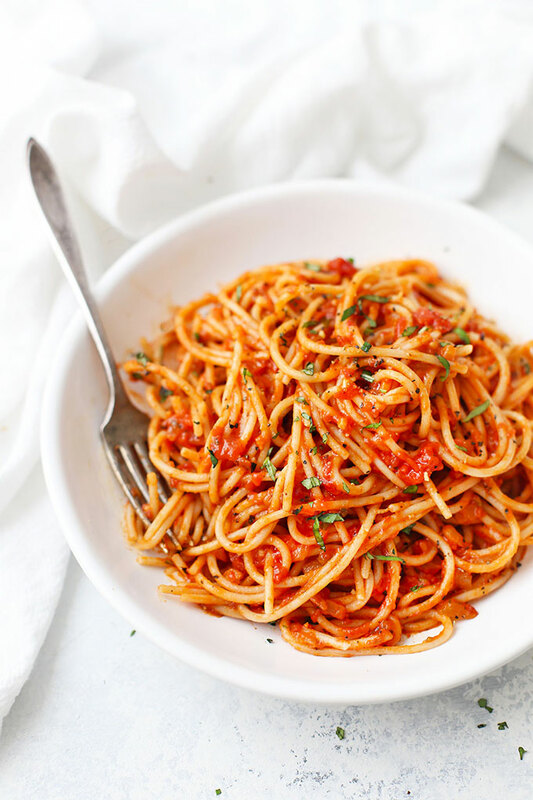 Pasta (Gluten Free or Not) – The natural pairing is pasta for Pasta al Pomodoro. 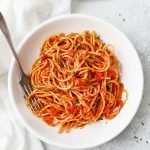 We’re gluten free, so we like Jovial or Tinkyada brand brown rice spaghetti with our pomodoro sauce, but spirals or fusilli are also delicious (and do a great job holding onto the sauce!). Zucchini Noodles – Paleo or avoiding grains? Zoodles (zucchini noodles) are a great option! You can use a spiralizer to make zucchini “pasta” that’s delicious and has that delightful “twirl” factor of regular pasta. 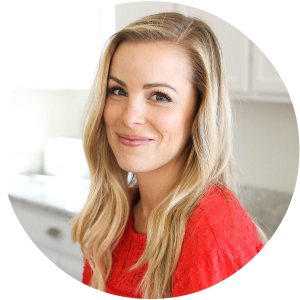 My friend Lisa has a great tutorial for perfect zucchini noodles. Spaghetti Squash – Another lower carb or grain free option is spaghetti squash. I’ve become a big spaghetti squash fan since going gluten free. It’s a nice change of pace every once in a while, and is a great way to sneak in some extra veggies. My favorite method for cooking spaghetti squash is outlined here. Your Favorite Proteins – You can easily create a Chicken Parmesan effect by combining your favorite grilled (or breaded, if you like) chicken with pomodoro sauce. Or, you can stir in some Italian chicken sausage slices or ground Italian sausage. Even another idea is to stir in some grilled or sautéed shrimp for a shrimp pomodoro! See? Flexible. Can I freeze pomodoro sauce? Absolutely! Transfer it to an airtight container or freezer-safe bag, remove as much air as possible, and freeze till solid. If freezing it in a bag, I recommend laying it flat on a plate to freeze, which makes it thinner and easier to store. (It will thaw faster this way than it will if it’s in a big lump.) It re-heats like a dream! Can I use fresh tomatoes? Yes! You can use the same amount of fresh tomatoes as canned. Since the sauce can get “seed-y” fast with fresh tomatoes, I recommend scooping out the flesh of at least some of the tomatoes (if not all). How do I use pomodoro sauce? I recommend checking out the “What to serve with pomodoro sauce” section above for lots of ideas! How long will it keep? Fresh (in the fridge) pomodoro sauce will keep about 1 week. In the freezer, it will keep up to 2-3 months. What if I want it thicker or thinner? For thinner pomodoro sauce (if it’s thickened more than you like during simmering), you can add a ladleful of water, broth, or pasta cooking water to loosen it up again. For thicker sauce, let it simmer a few extra minutes and more liquid will evaporate. 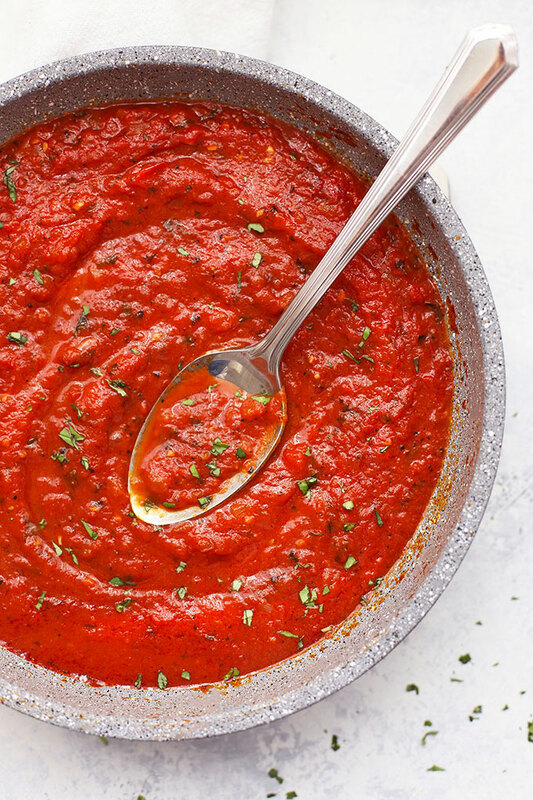 Pomodoro Sauce – This simple tomato sauce is perfect for serving with pasta, zucchini noodles, spaghetti squash, or your favorite proteins! In a large sauté pan or Dutch oven, heat olive oil over medium heat. Add onion and sauté 5-7 minutes, or until translucent and tender. Add garlic, a pinch of salt & pepper, and the red pepper flakes and cook 1 minute more. Add crushed tomatoes and fresh basil. Stir to combine. Bring to a simmer and reduce heat too low. Simmer 15-20 minutes to allow the flavors to meld together. Serve with pasta, zucchini noodles, spaghetti squash, or your favorite proteins!